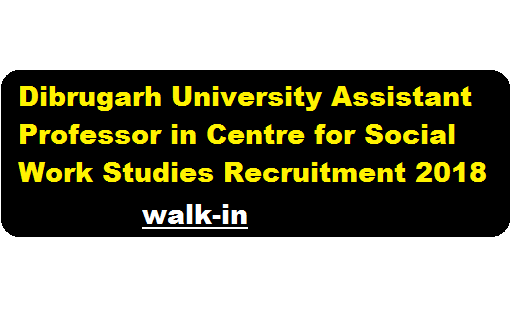 Dibrugarh University Recruitment 2018 September – Assistant Professor in Centre for Social Work Studies :- According to the latest Dibrugarh University Recruitment 2018 September A Walk-In-interview will be held on 12/09/2018 at 10.30 A.M. in the Bhojraj Seth Conference Hall of the Vice-Chancellor’s Office D U. for 02 (two) posts of Assistant Professor(s) on contract basis in the Centre for Social Works Studies. Dibrugarh University. with the following qualifications. In this section, we will discuss in detail about Recruitment of various posts under Dibrugarh University Recruitment 2018 September with all the details and requirement. Qualification: Masters degree with First Class in Social Work. Specialization in Human Resource Management. NET qualified candidates will be preferred. Qualification: Masters degree with First Class in Social Work Specialization in Family and Child Welfare. NET qualified candidates will be preferred. Interested candidates having the requisite qualification may appear in the interview with copies of bio-data, attested copies of all testimonials and experience certificate, (if any) along with the original certificates of qualifications for verification. Interview Time & Venue : 12/09/2018 at 10.30 A.M. in the Bhojraj Seth Conference Hall of the Vice-Chancellor’s Office D U. Candidate shall be required to pay an amount of Rupees Two Hundred (Rs 200/-) only as Registration Fee. No. T.A and D.A will be admissible for the purpose.